There's no time like fall, especially on a snowy weekend where you get to spend all day Sunday inside with someone you love, to bake a pie or two, especially when it means getting to try out my new and oh-so-cute fall pie crust cutters. I've baked a lot of cakes this fall, but it was time for cake to give way to pie for a change. And with a few pie orders coming up this holiday season, I wanted to tweak a few recipes to make sure they were perfect. In anticipation of all the pies I need to bake for Thanksgiving, I mixed up batch after batch of pie dough, and now have 8 plastic-wrapped disks of dough waiting their turn in the freezer, to become a delectable pie over the next few weeks. That's not even going to be enough, though, so I still need to mix up some more dough, as well as experiment with some gluten-free options for Thanksgiving dinner at a friend's house. 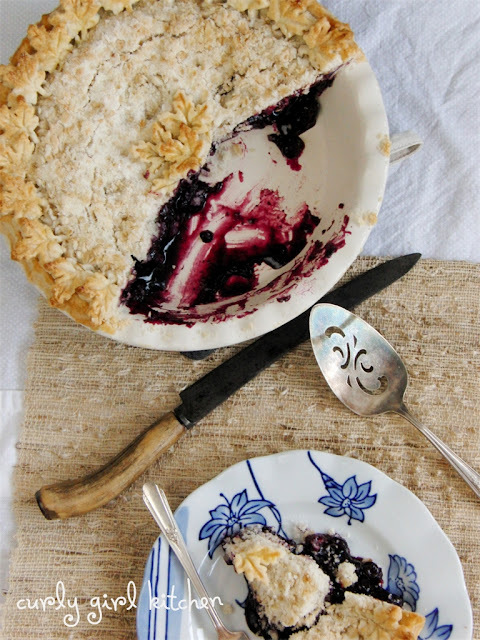 A big bag of blueberries was already in the freezer, so blueberry was the pie of choice last weekend. 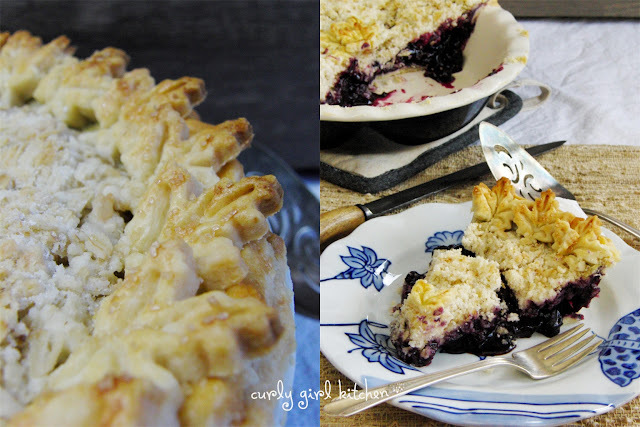 With the scent of flaky, buttery crust and the sweet blueberry filling with a hint of cinnamon, it was hard to wait long enough for the pie to cool and set before cutting the first piece. 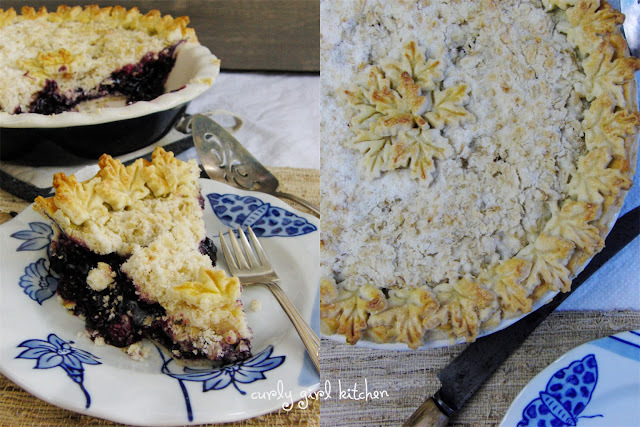 A delicate crumb topping and a border of sugar-crusted pie crust leaves was a pretty and delicious touch. 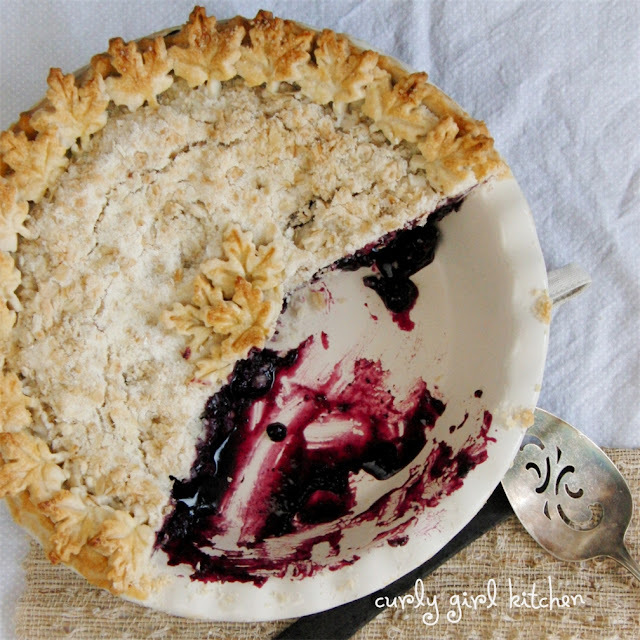 Prepare the pie crust and refrigerate until ready to use, taking it out of the fridge about 10 minutes before you're ready to roll it out. In a saucepan, combine the blueberries, sugar, cornstarch, water, lemon juice, cinnamon and salt. Simmer over medium low until the mixture gets juicy. Increase to medium/medium-high and bring to a boil while stirring constantly. Boil for 1-2 minutes until mixture thickens enough to coat a spoon. Stir in the vanilla then set aside to cool for 30 minutes. Preheat the oven to 375. Line a baking sheet with foil. Spray a deep-dish pie pan with non-stick spray. Roll out the pie dough large enough to fit into the pie pan with a 1-inch overhang. Fit one of the circles of dough into the pan and sprinkle the bottom of the dough with about a tablespoon of flour (to prevent it from getting soggy). 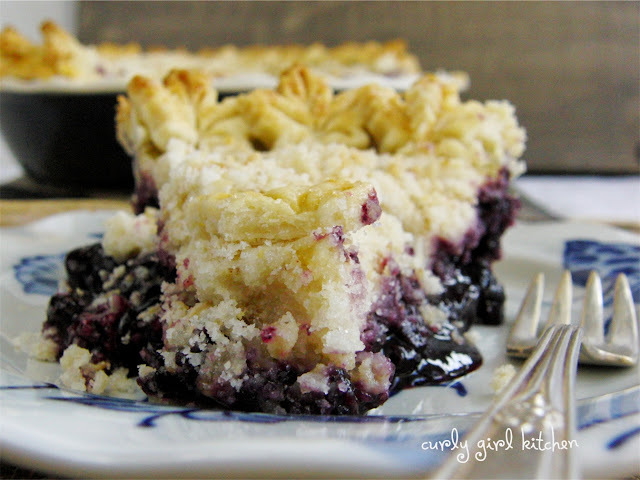 Pour the blueberry filling into the crust. Place the other circle of dough on top, press the edges slightly to seal it with the bottom crust, then trim the overhang with a knife. Use your fingers to crimp the edges. Cut 5 slits in the middle of the crust to vent the steam. Place the pie on the baking sheet. Bake for 20 minutes while you prepare the topping. Combine the topping ingredients in a bowl and use a pastry cutter to cut the butter in until coarse and crumbly. Refrigerate until ready to use. For decoration, gather all the scraps that you cut off the edge of the pie, roll them out again, and cut leaves using a leaf pie crust cutter (I purchased my cutter from Williams Sonoma). After the pie bakes for 20 minutes, take it out of the oven and brush the edges with an egg wash (1 egg, lightly beaten with 1 teaspoon water). Place all the leaf cutouts around the edge of the pie (the egg wash helps them stick). 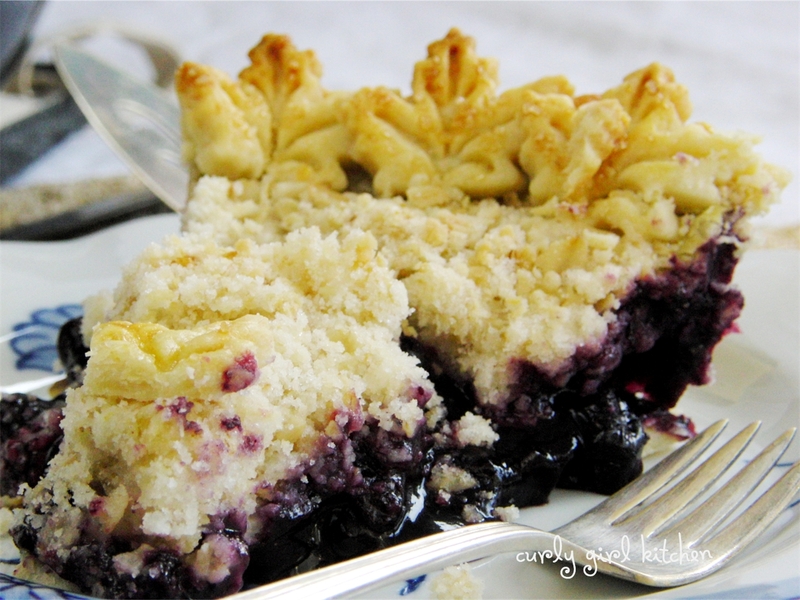 Sprinkle the crumb topping into the middle of the pie, and place a few more leaves in the middle. Brush all the leaves with the egg wash, too (to promote browning) and sprinkle lightly with a little coarse turbinado sugar. If not using the leaf cutouts, simply sprinkle the crumb topping over the pie (after it's baked for 20 minutes). Return to the oven, and bake for an additional 30-40 minutes until browned on top. Set pie on a wire rack and cool for at least 5-6 hours or overnight before cutting.